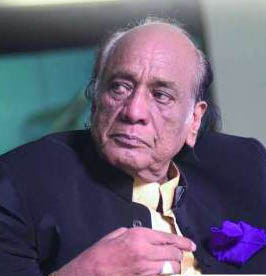 "Legendary Mehdi Hassan passes away False News"
Mehdi Hassan was born on 18 July 1927 in a village called Luna in Rajasthan, British India into a family of traditional musicians. He claims to be the 16th generation of hereditary musicians hailing from the Kalawant clan of musicians. Mehdi Hassan has been ill for the last few years due to a serious lung condition that has led to complications and breathing problems.On Friday 13 December rumors of his death circled social media websites though it was later confirmed by his son that Mehdi Hassan is alive. “He is still in the ICU and doctors are looking after him round the clock. All we can do now is pray for him and hope Allah gives him life,” said Hassan’s son, Asif Mehdi himself a singer. We seriously do not understand what is wrong with people now a days.Few days back Pakistani Cricket Inzimam ul Haq death rumor was spread through social media websites and now of Ustad Mehdi Hassan.We request such people to please stop spreading such rumors.